김정호(金正浩)가 1834년 제작한 전국 조선전도로 채색필사본이다. 국립중앙도서관에 소장되어 있다. 『청구도』는 전국을 남북 29층, 동서 22개판으로 구획하여 전국을 그렸다. 지도의 한 면은 남북 100리, 동서 70리의 범위를 그렸으며, 축척은 『대동여지도』(1861)와 동일한 약 16만분의 1이다. 김정호는 18세기 말부터 진행되어 왔던 기존 지도의 문제점 극복을 위한 노력에 공감하고, 이에 한 걸음 더 나아가 자신 나름의 독창적인 생각을 반영하여 청구도를 제작하였다. 그는 종래 지리지에만 수록되던 정보를 지도로 표현하면서 활용가치를 높이고자 하였다. 즉 모든 고을마다 호구수, 토지 면적, 군사의 총수, 세금으로 거두어들인 곡식의 총량, 한성까지의 거리 등을 기록하고 중요한 역사적 사건이 있었던 곳에는 그 내용을 기록하였다. 이를 통해 『청구도』는 기존 전국지도 위에 중요 역사지리 정보를 비교적 상세하게 수록한 지도가 되었다. 『청구도』는 여러 질이 남아 있으며, 2책 혹은 4책으로 구성되어 있기도 하며, 지도의 묘사방법이 부분적으로 차이가 있다. 국립중앙도서관 소장 『청구도』는 2책으로 구성되어 있으며, 보관상태가 좋고 구성이 뛰어난 지도책으로, 역사적·학술적 가치가 높다. With the cover title Cheonggudo, literally a “Map of the Blue Hills,” as Korea was referred to by the Chinese, this is the first general map of Korea made by Kim Jeong-ho (1804-1866), the father of Korean cartography. Kim completed this map in 1834, joining in the efforts which had been under way among local mapmakers since the late 18th century to overcome problems with conventional maps and further contributing his creative ideas. Kim tried to enhance the practical value of maps by combining geographic information that had only been recorded in gazetteers. As a result, the maps here contain historical and geographical information about individual counties such as the number of households, farmland areas, troops available for mobilization, amounts of grain collected as taxes, distance to the capital city, and sites of major historic events. This is how the map attained its unique composition as a comprehensive source of relatively detailed historical and geographical information about each region. 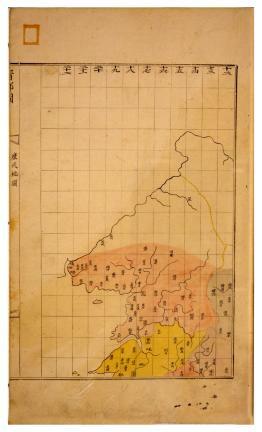 The Map is housed at the National Library of Korea. 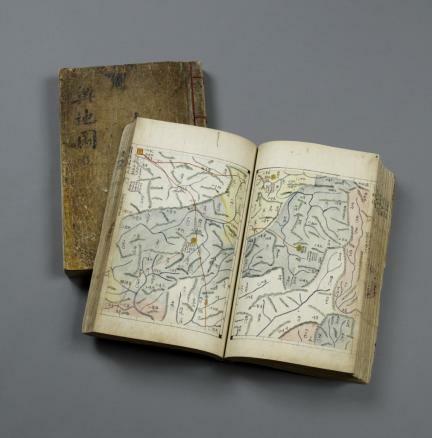 Along with another Cheonggudo at Yeungnam University Library, this remarkable compilation of well-organized, hand-drawn colored Maps is in an excellent state of preservation.